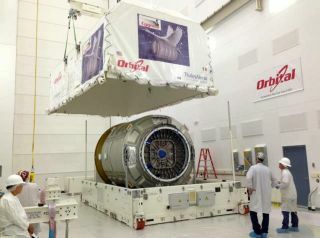 Orbital Sciences Cygnus spacecraft, the "Spaceship C. Gordon Fullerton," is seen in July 2013 after arriving at NASA's Wallops Flight Facility in Virginia for pre-launch processing. The next U.S. private spacecraft to fly to the International Space Station has been named for Gordon Fullerton, the late NASA astronaut who helped to deploy air-launched rockets built by the company behind the space freighter. NASA astronaut and research test pilot C. Gordon Fullerton, seen here in 2002, died Aug. 21, 2013 at age 76. Before developing Cygnus and the Antares rocket, Orbital Sciences introduced the Pegasus in 1990 as the first commercially-developed launch vehicle. Used to deploy small satellites, the winged Pegasus' first stage is an aircraft, initially the B-52 and today, the L-1011 commercial transport.